This week’s mystery movie was the 1951 film “He Ran All the Way,” directed by John Berry, with John Garfield, Shelley Winters, Wallace Ford, Selena Royle, Gladys George, Norman Lloyd and Bobby Hyatt. The screenplay was credited to Hugo Butler and Guy Endore (actually Dalton Trumbo) based on the novel by Sam Ross. The photography was by James Wong Howe with music by Franz Waxman. It is available from Kino films on DVD and Blu-Ray. It will be shown during the TCM Classic Film Festival on April 29 at noon at the Egyptian Theatre, with Dennis Berry, the son of director John Berry, and Hollywood Reporter film critic Todd McCarthy. As Mike Hawks pointed out, this was Garfield’s last film and he died less than a year later. on what is now Onizuka Street in Little Tokyo via Google Street View. Lloyd and Garfield as beautifully photographed by James Wong Howe. For Monday, we have this shadowy image of a mystery gent in a double-breasted suit. He has a blurry companion. Update: This is A. Cameron Grant. Google Image Search will be of no help to you. For Tuesday, we have a mystery police officer. Update: This is Dale Van Sickel. For Wednesday, we have a mystery couple. Here’s the mister…. Brain Trust roll call: Don Danard (Tuesday’s mystery police officer) and Maricatrin (Tuesday’s mystery police officer). Update: This is Wallace Ford and Selena Royle. As usual, Google Image Search will be totally unhelpful. And for Thursday, we have a mystery woman in a mysterious swimming pool. Update: This is Shelley Winters. Brain Trust roll call: Mary Mallory (mystery movie and Tuesday’s and Wednesday’s mystery guests), Don Danard (Wednesday’s mystery gent), Jenny M (mystery movie and Wednesday’s mystery guests), Mike Hawks (mystery movie and Tuesday’s and Wednesday’s mystery guests), Floyd Thursby (mystery movie and Wednesday’s mystery guests), Dewey Webb (Wednesday’s mystery gent), Howard Mandelbaum (mystery movie and all mystery guests), Patrick (Wednesday’s mystery gent), David Inman (Wednesday’s mystery gent, wrong movie), Lee Ann, Megan and Thom (Wednesday’s mystery gent), LC (mystery movie and mystery cast), Anne Papineau (Wednesday’s mystery gent), Bob Hansen (Wednesday’s mystery guests) and Sheila (Wednesday’s mystery gent). Hint: She is not Frida Kahlo or Albert Einstein. Or Leopold Senghor. And for Friday we have our mystery leading man. Brain Trust roll call: Mary Mallory (Thursday’s mystery woman), Dewey Webb (mystery movie, Thursday’s mystery woman, another pairing of Thursday’s mystery woman and Wednesday’s mystery gent), Mike Hawks (Thursday’s mystery woman), Patrick (mystery movie, Wednesday’s mystery gent, Thursday’s mystery woman), Lee Ann, Megan and Thom (mystery movie, Thursday’s mystery woman), Howard Mandelbaum (Thursday’s mystery woman) and Bob Hansen (Thursday’s mystery woman and Wednesday’s mystery woman. I don’t think Windom ever tipped the scales like our mystery guest. My first reaction was William Windom as well, but it is clear the era and the mystery man´s girth isn´t right. I had the lucky experience of sitting next to Mr. Windom on a flight many many years ago (before ¨Murder She Wrote¨) and he was the nicest man! Immediately thought debauched William Windom and wham, theory disproven. And I have no others. The Police Officer is stuntman Dale Van Sickel. Is that Rod Cameron without a horse? Alas, no. But a good guess. Dale Van Sickle is the police officer. The heavy-set gentleman looks sooo familiar, but I can’t place him. HE RAN ALL THE WAY. Selena Royle today and Dale Van Sickel yesterday. Wednesday’s Mister is Wallace Ford. Can’t recall the ladies name. Wallace Ford and Selena Royle in He Ran All the Way. Tuesday Dale Van Sickle, today Wallace ford and Selena Royle in HE RAN ALL THE WAY. Wednesday’s mystery mister is Wallace Ford. Is Wednesday’s gentleman Wallace Ford? I’m thinking Wallace Ford maybe. On Wednesday, we have Wallace Ford and Selena, whose last name I can’t remember! I don’t know the title though. Shelley Winters in a bathing cap. Shelley Winters in the flesh. Wallace Ford + Shelley Winters = He Ran All the Way from 1951. As Monday man appears so difficult I feel I dare have a guess. How about Harvey Dunn? Alas, I’m afraid not. All will be revealed tomorrow! Our guess for today is the dynamic Shelley Winters and the movie is “He Ran All the Way”. Thursday is Miss Shelley Winters. And I remembered Selena’s last name (from Wednesday) -it’s “Royle”. Garfield on the run today. Friday: at last someone I know. John Garfield. Thurs is Shelley Winters in a bathing cap. Friday is John Garfield – this is He Ran All The Way. Wed is Wallace Ford and Selena Royle. John Garfield says goodbye to movies in this film. 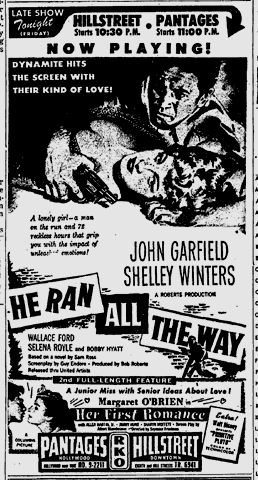 Wallace Ford on Wednesdat, Shelley Winters on Thursday, and John Garfield on Friday in He Ran All The Way.